I’m looking forward to attending the WaterDocs Festival in Toronto next week. One person heavily involved in the film festival before her death was Marjorie Sharpe who was also the founder of the Toronto Community Foundation. The arts organization that I headed up for in the 1980’s was the Foundation’s first grant recipient and it was a privilege to connect with her every year - and wonderful to learn only now of her passion for water and the need to care for it. Thomas Berry stressed the need for all disciplines and organizations to converge in the great work of telling the new story. The young founder of Unify noted in a presentation at the 2018 Parliament of World Religions that film is the Shakespeare of our day in terms of impact -and his own film on water attests to this, Music is a natural too - and I look forward to coming performances of Missa Gaia. But I was especially moved by Bill McKibben’s article last fall about the role of two young poets. One watches ice turn to water. Another sees her home go under water. The UN reports give access to real rather than alternative facts. But we human beings need stories to bring the truth home in a way that encourages us to change. It was Shelley who told us that “poets are the unacknowledged legislators of the world". See how the poets help McKibben bring reality to this very important message. There are a number of personal strands in the announcement that Paul Winter will receive the Thomas Berry Award at the coming conference of the American Teillhard Association annual meeting to be held at the Cathedral of St, John the Divine in New York City. While I am a supportive newcomer to the worlds of Berry and Theillard, I had a small connection with Paul Winter several decades ago. Winter is a jazz musician of considerable prominence. His original sextet toured the world and was the first jazz combo to play at the White House. His later Consort has existed for years with a rotating membership. In the 1970’s Winter became interested in another species and its ability to make music - whales - and travelled with Greenpeace to try interaction with them and his soprano saxaphone. This encounter later produced the Missa Gaia or Earth Mass, which had its world premiere at the Cathedral of St. John the Divine in 1981 and continues to be performed there each year. Performers include a chorus, vocal soloists, the jazz consort and an assortment of recorded whales, wolves and other animals, whose songs often provided the inspiration for the melodies. You can hear the entire mass here as well as several selections on YouTube. It’s not surprising that Winter and Thomas Berry connected in New York City when they were both involved in shifting our consciousness to the beauties of the natural world and our responsibility to protect it. My own threads are many. I taught at a small Episcopal School near the Cathedral from 1960 -1963. The school at the time was in the process of raising funds to build a new facility and used one the Cathedrals’s chapels for the school to start the day. The work was premiered in Canada as part of the Joy of Singing International Choral Festival in 1989 by the Consort with the Toronto Mendelssohn Youth Choir conducted by Robert Cooper. As the Executive Director of the provincial service organization for choirs at the time I was a last minute adult recruit buried in the alto section when the conductor thought it needed an extra voice two. It was one of the most inspiring and enjoyable performing experiences of my life. While I probably won’t make the award ceremony, it is gratifying to know that I will hear the Missa Gaui performed again in Toronto by a local choir and joined by some of Canada’s best classical, jazz and gospel musicians. You can find more about the Toronto concert here. And it is also good to know that Thomas Berry wrote a beautiful poem after attending a Winder Solstice performane of this work, which is the last entry in one of his books. You can find a brief quote from it elsewhere on this site. I have been exploring people and organizations within my own community. My own parish encouraged our children to help raise funds for clean water in first nations communities. While the difficulties in providing good systems for small and remote communities are substantial, the reality is still shameful. In the process of exploration, I have asked for help and received good advice and contacts. One resulted in an invitation to a recent book launch. Now I have another one and at the bottom of it is a notice about a WaterDocs Festival. Its founder was someone I knew well 30 years ago when I was an arts administrator - but I never knew her with this connection. There are so many awful uses of technology - but the good ones redeem them. I’ve heard some wonderful musicians in my time but a recent performance was remarkable. In the complex where I used to live we started a small concert series for the neighborhood and it has lasted several years with a variety of performers. This one was special because we were introduced to something totally new to us. When a five year old starts to play the accordion look out. Michael Bridge has not only mastered the traditional one but introduced us to the digital one. The following performance is done entirely on this single instrument. It appears on his most recent recording. 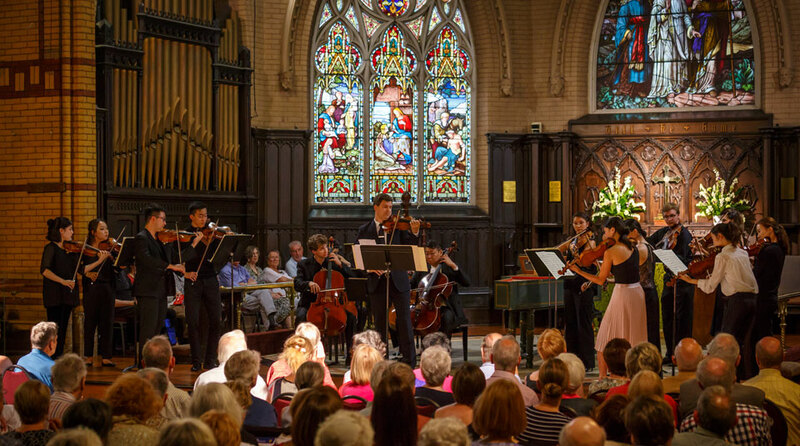 A recent review of the closing of the Toronto Summer Music Festival is highly positive but questions why the audience is moved to so many standing ovations. In one way I know what he means. Some years ago at the conclusion of a performance of Mahler's Symphony of a Thouand, I found myself propelled to a standing position by the sheer force of it. There was nothing polite about it involving a decision to get up. It just happened. The critic wishes that the crowd wouldn't jump up so enthusiastically so often, even though he commends the Festival format with its combination of free and paid performances, a tight time frame and a summer timetable. Perhaps I can help - as a well tempered listener who attended more than 25 of the events. The reviewer does note that there is a core audience like me that attends everything. I'm a relative newcomer, but some have attended in the same way over the last 13 years. They know the returning performers by name and have a strong sense of who they are. I had the privilege of sitting at the feet of the late Nicholas Goldschmidt in the 80's. At that time Niki was already more than twice the age of current artistic director Jonathan Crowe and he had honed the concept with an understanding that Festivals create excitement and momentum in a way that a single performance never can. Even subscriptions, great as they are, have too much space between events for that. Niki's Festivals often crossed artistic discipline lines. Jonathan's combine different musical genres and levels of experience in the presenters. One of the strengths of this Festival is that it unites up-and-coming instrumentalists and singers with the finest professionals. The pros mentor the emerging artists by rehearsing and playing with them in public - or in the case of the singers, by conducting public masterclasses. The result is an immersion in all kinds of music and levels of understanding for both for performers and the listeners. Audience members stroll up the shady Philosophers Walk night after night fulfilled and happy. The critic, perhaps correctly, thought the young instrumentalists in the final concert were too energetic and needed more nuance. Probably that is true. But what he perhaps misses in the standing ovations of the appreciative audience is their dominant demographic. Put aside for the moment the worry that there will be no audience for classical music in the decades to come. What those of us at this stage of our life recognize is the sheer beauty and poignancy of so much of what we are hearing - perhaps for the last time. It's worth standing up and applauding for that.